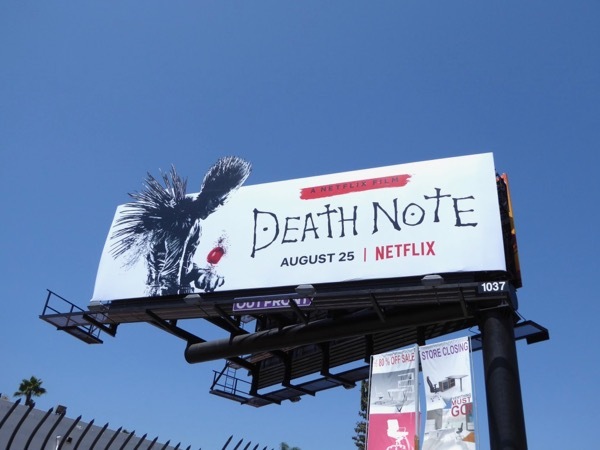 Horror seems to be all the rage in the skies at the moment with new scary movies on the big screen, returning TV shows coming this fall and original films streaming on Netflix. 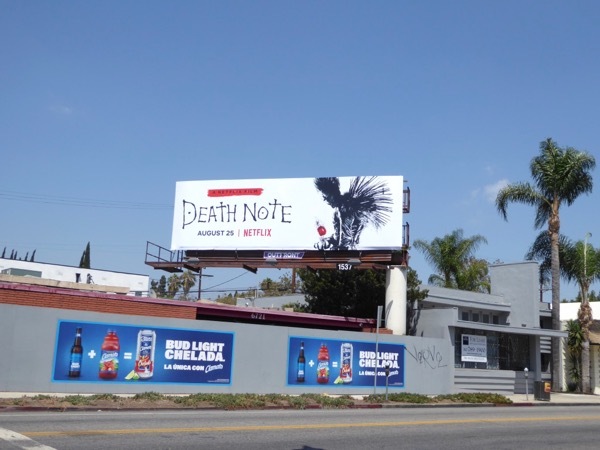 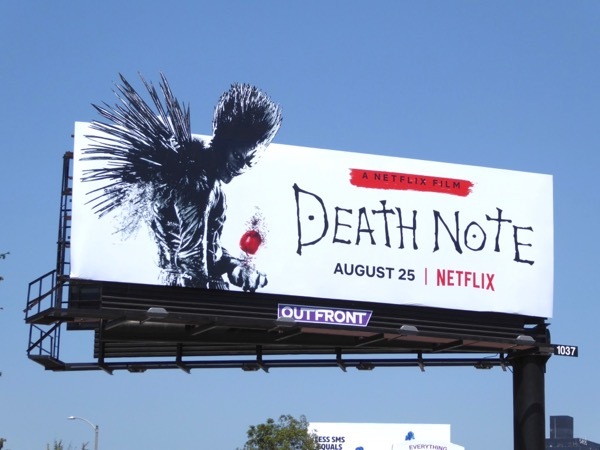 Death Note comes to life on the streaming service courtesy of You're Next director Adam Wingard and is based on the Japanese manga created by Tsugumi Ohba and Takeshi Obata. 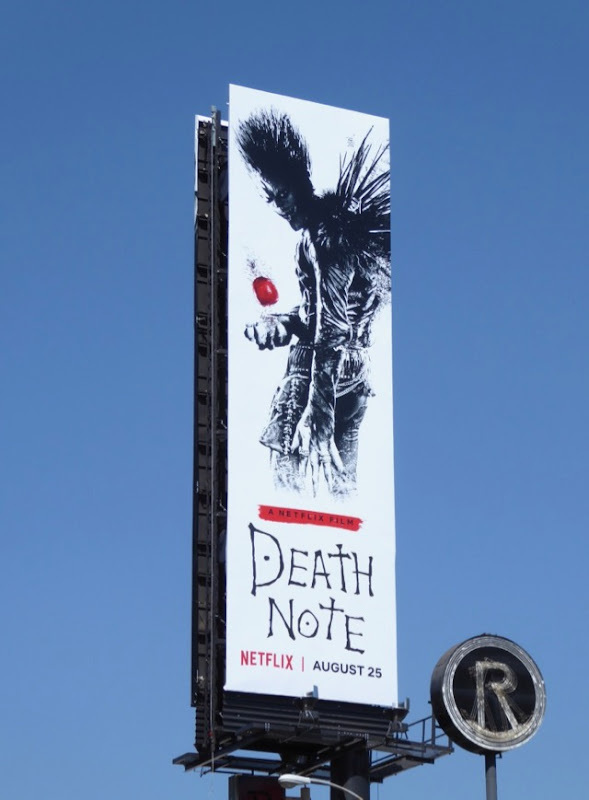 The fantasy horror stars Nat Wolff as a high school outcast called 'Light Turner' who discovers a supernatural book, known as the Death Note, that can summon the spiky death god 'Ryuk' (voiced by Willem Dafoe) by writing the name of anyone on its parchment pages. 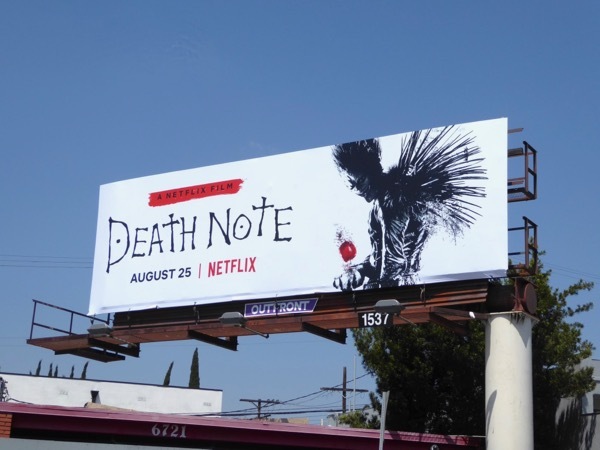 Things take a dark turn when Light uses the book to start killing his high school bully, settling old vendettas and targeting random scumbags. 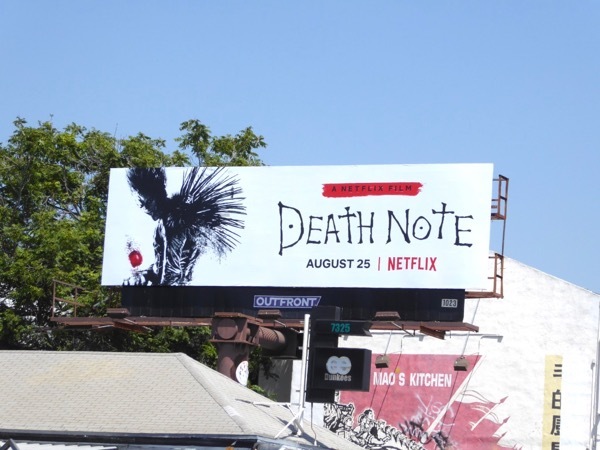 The striking standard landscape billboards for the film were spotted along the Sunset Strip and Melrose Avenue on August 16, 2017. 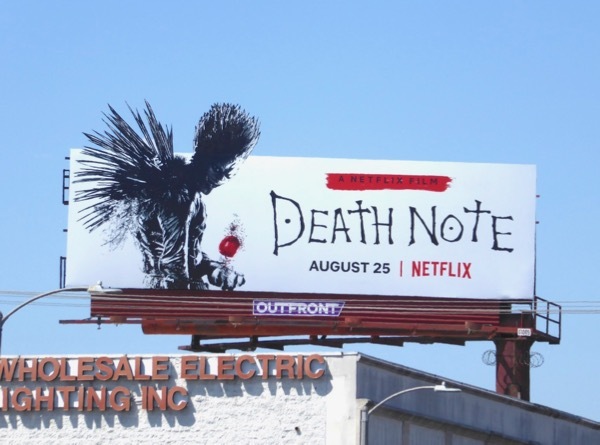 Meanwhile the special extension cut-out versions were snapped along La Brea Avenue and Beverly Boulevard on August 22, 2017. 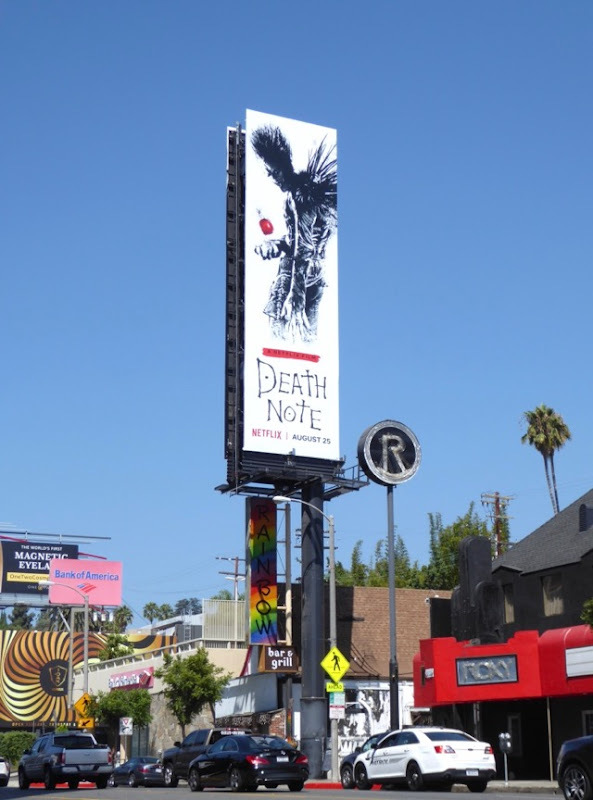 Fans of Nat Wolff can also check out this Paper Towns movie billboard, whilst horror aficionados can also enjoy all these horror-themed movie and TV billboards. 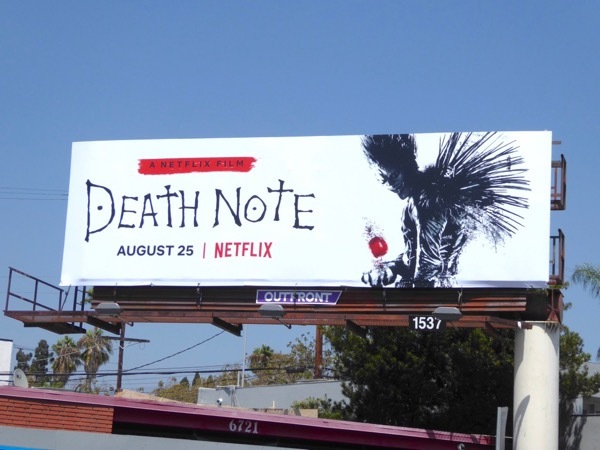 Let's hope this Netflix film adaptation can please die-hard fans and those viewers just needing some summer scares, and doesn't leave too much of a sour note with audiences.